About a year ago Capcom released Resident Evil HD Remaster and fans couldn’t have been happier at the time as the game’s visual upgrades and the technical tweaks to the original formula came off as a revival of a series that fans have seen change quite a bit over the years. Now here we sit with Resident Evil 0 HD Remaster which, unlike the first game, was released originally for the Gamecube and saw quite a few additions to the formula that fans had grown used to back in 2002. So has Resident Evil 0 HD Remaster successfully bridged the fourteen year gap as well as Capcom’s first HD Remaster? Set shortly before the events of the original Resident Evil, the story begins with Raccoon City’s Special Tactics and Rescue Service, better known as S.T.A.R.S., Bravo Team being sent into the mountains outside of the city in order to investigate a series of murders involving cannibalism. Before arriving on the scene their helicopter experiences engine failure and crash lands in the middle of the forest. With the team stranded they stumble upon a few dead soldiers who were originally escorting a convict named Billy Coen. Choosing to split up, the young Rebecca Chambers discovers a train disabled in the forest and soon finds that the entire crew is dead. Or at least they appear dead. Instead she comes face to face with the zombified horrors that personify the Resident Evil series and is only able to continue after putting them down. She soon encounters Billy on the train and, after encountering swarms of leeches capable of killing and controlling humans, they begin to work together in an effort to survive being separated from the rest of Bravo Team and against the strange horrors that Umbrella has been cooking up. 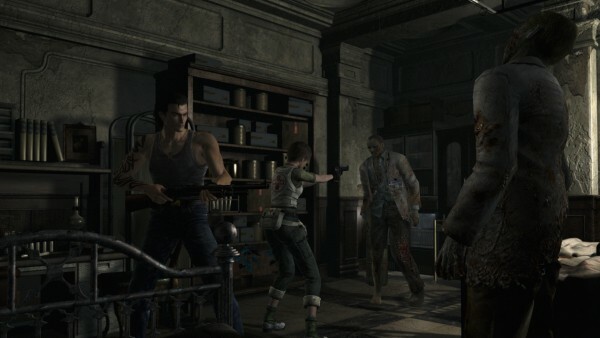 Now unlike the original games that saw players choosing between main characters, Resident Evil 0 introduced the concept of having an ally with the player most of the time which eventually evolved into a format fans are quite familiar with. This means that unlike the first few games, player experience will be largely the same as they make their way through the story as there will be few differences with these characters even if Billy and Rebecca are occasionally separated throughout the story. As for the actual storyline here, Resident Evil 0 HD Remaster doesn’t try to fix any issues that the original storyline had. 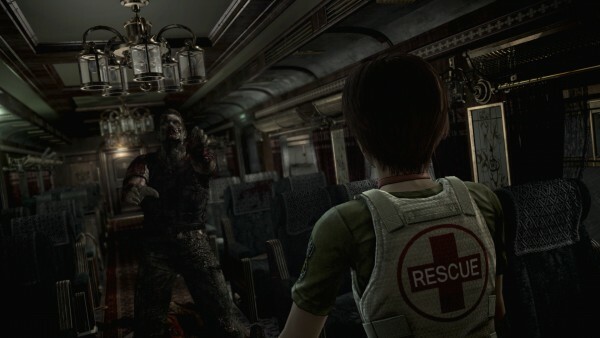 You see thanks to the storyline being set before the original Resident Evil, this one’s story is primarily set to serve as a precursor and fill in a few blanks in the original story’s narrative and while it does handle certain events rather well and tells a satisfying story, Rebecca is handled poorly when compared to her situation in the first game. 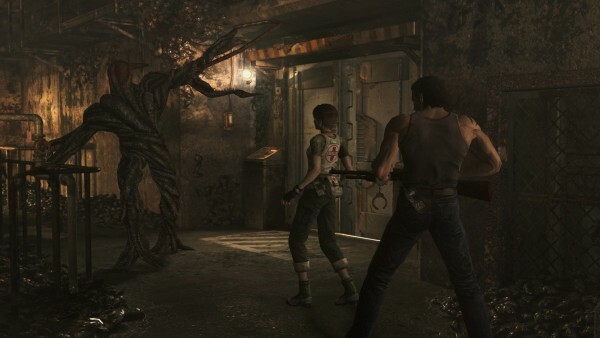 While Billy’s situation and lack of presence is understandable, his backstory feels as lackluster as it can be when it comes to his reason for being seen as a convict and in the original game, Rebecca is treated as an inexperienced and timid officer however this story tells of her encountering far worse creatures than just zombies long before Alpha Team discovered her in the mansion, leaving a rather large discrepancy considering how she acts in the original game. Resident Evil 0 may have introduced a few new mechanics when it was released but at its core it still offers exactly what fans expected of the series at the time and that remains true in Resident Evil 0 HD Remaster. Except for on the easiest difficulties players will need to play smart in order to survive with a limited amount of ammo, healing items, and inventory space as they juggle weaponry, ammo, recovery items, and objects necessary for completing puzzles. This title does offer something that does make inventory management a bit easier, however it also offers quite a large number of items to juggle at times making it quite difficult even with this mechanic, especially since some weaponry takes up two of six precious inventory slots. I’m talking of course about the ability to drop items and being able to pick them up at a later time. Except for certain locations, players will easily be able to drop temporarily unnecessary items and recover them later once they have inventory space whenever they feel like it. 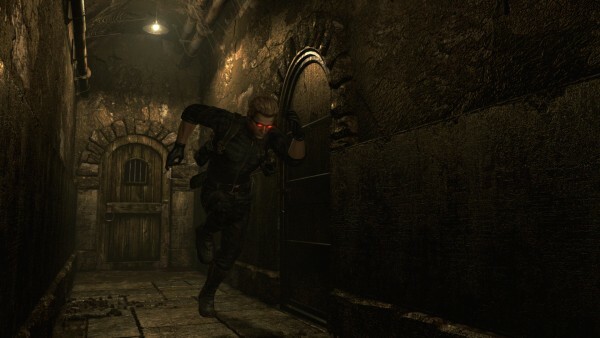 This does become something of an issue with the game however as, far too often, players will be required to run back and forth from various locations in order to gather everything necessary for certain puzzles. Players can also make use of the exchange feature by swapping items between Rebecca and Billy when they are near one another and make use of Rebecca’s mixing kit to combine herbs together. As for the other major addition to the core game, is the idea of playing with a partner. The ally AI can be easy to handle for the most part, with it being possible to partially control their movement with the right analog stick and being able to tell them whether they should openly shoot enemies, silently follow you, or simply stay and wait at their current location. This allows players to team up and take down opponents a bit easier, though with your partner being able to die just as easily as your current character can, players always need to be sure to keep an eye on both characters’ health, especially since the ally AI can be a bit wonky at times. One thing that Resident Evil 0 does lack however is variety and memorable enemies. While the classic zombies make a return and a few other mainstays, far too many new monstrosities Rebecca and Billy face off against are simply large and slightly twisted varieties of animals that end up being entirely forgettable in the long run. Resident Evil 0 HD Remaster has been given the same type of revised control treatment as Resident Evil HD Remaster. This means that while players can take advantage of a revised and modern control scheme that allows for faster movement, players can also switch out with the classic tank controls if they so wish. Considering the numerous tight areas that players will navigate and the classic one-angle camera views always keep the tension high, it is almost recommended to use the older control scheme to allow for better control in these tight situations as moving too quickly can easily result in an unexpected death in a game that remains as punishing on harder difficulties as fans will remember. One unexpected but rather fun addition in Resident Evil 0 HD Remaster is the unlockable Wesker Mode. 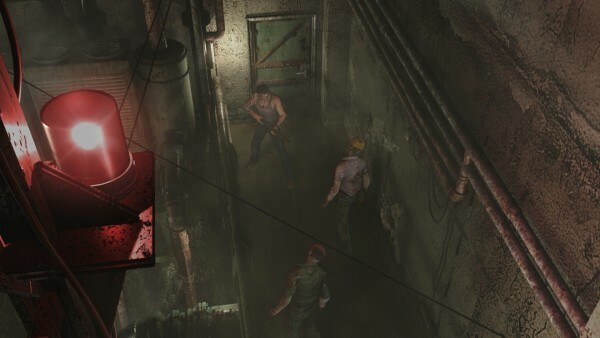 This mode, which is unlocked after clearing the main story, replaces Billy with none other than Albert Wesker. Wesker is more than just a replacement though as he also comes with superhuman abilities such as the ability to move incredibly fast and use a telekinetic like blast capable of knocking down and potentially killing enemies. 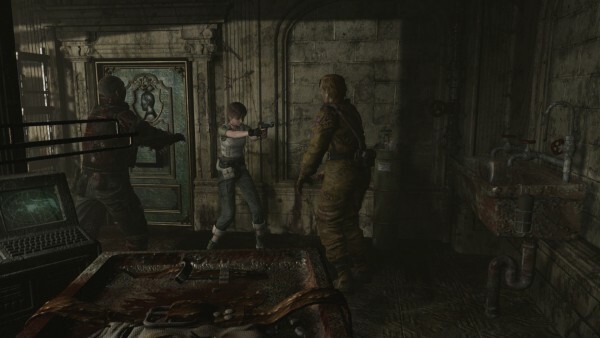 In this mode Rebecca is given a special costume similar to what Jill Valentine wore in Resident Evil 5 when she was being mind-controlled. While it doesn’t change things up too much, this new mode is a welcome inclusion to an already enjoyable game and one that makes it well worth running through a few extra times. The biggest part of Resident Evil 0 HD Remaster is the fact that the game has been given a visual upgrade in nearly every regard. This includes redesigning certain areas of the game and upgrading how the static backgrounds look. This allows the classic spooky atmosphere of the original title to translate perfectly into the modern era with the single camera angles and rather gorgeous looking background designs all being touched up to look rather impressive. Even the character models have been given some modification here and there as Rebecca and Billy have been improved visually with extra bits of detail here and there which is a nice touch since certain costumes are already available at the start of the game allowing players to change things up at will. It is worth noting that players can choose to play the game either in 16:9 and 4:3 format if they wish. Unfortunately one area that the game does look extremely rough in is during the CG cut-scenes that are scattered throughout the game as it appears these sequences were not touched up in any way and look rather bad compared to the rest of the title’s upgrades. As for the soundtrack, the title features some great sounding atmospheric tunes that fit perfectly with the creepy designs of the places players will explore, even though most of these areas aren’t the most imaginative outside of the initial train section. The voice work appears to sound the same as in the original release and works well enough with what fans will remember. Resident Evil 0 HD Remaster has been given the same loving that Resident Evil HD Remaster was given and then some with the fun little addition of the brand new Wesker mode. That being said, providing modern controls and remastered graphics doesn’t fix up some of the issues of the original game such as the issues regarding plot holes with Rebecca and fairly lackluster enemies to face off against giving the game a bit of a repetitive feeling. Even with these faults from the original game, those looking for a great classic survival horror will find that Resident Evil 0 HD Remaster is more than enough to scratch that itch as Capcom continues to offer great examples for how HD remasters should be handled.